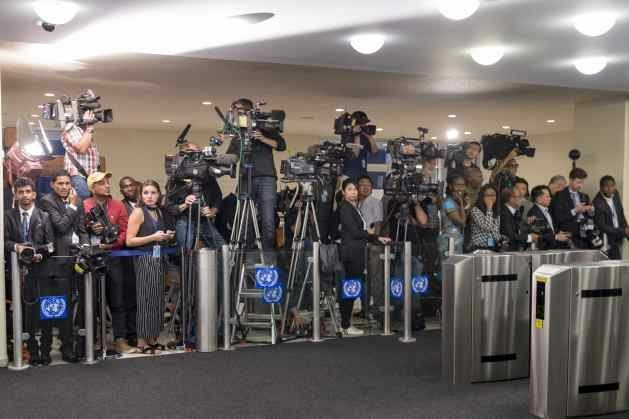 UNITED NATIONS, Nov 1 2018 (IPS) - Safety of journalists has featured prominently in international news in recent weeks. And yet, while some cases grab the headlines, many more do not, and the scale of the issue often goes unremarked. On this International Day to End Impunity for Crimes Against Journalists, it is worth pausing to reflect on some facts. Over the period 2006-2017, UNESCO has recorded 1,010 killings of journalists. A total of 80 journalists and media workers were killed in 2018 as of 9 October. On average, every five days, a journalist is killed for bringing information to the public. Many people operating in the new media ecosystem – such as citizen journalists and bloggers – are experiencing growing harassment, in part due to their ambiguous status under national legislation. Journalists are targeted for many reasons, and by many people. Some are investigating corruption and abuse of power. Some are expressing political or social views which others wish to silence. Some simply stand as a voice of peace in times of war. Irrespective of the motive, however, the systematic targeting of journalists is a telling reflection of how important – in fact, vital – their work is. The intimidation, harassment and killing of journalists are – no doubt – extreme forms of censorship, and a violation of Article 19 of the Universal Declaration of Human Rights, which, among other things, recognizes the freedom to “seek, receive and impart information and ideas of all kinds, regardless of frontiers”. But they also erode the conditions for peaceful and inclusive societies. For this reason, Goal 16 of the 2030 Agenda for Sustainable Development – agreed in 2015 by more than 150 world leaders – has an indicator that tracks cases of killing, kidnapping, enforced disappearance, arbitrary detention and torture of journalists and associated media personnel. This work has taken many forms: from facilitating a “Journalists’ Pact for Strengthening Peace” in Lebanon, to promoting a balanced media coverage of elections in Georgia; from supporting insightful reporting on the extractive sector in Kenya, to providing training to journalists on how to make the most of open data in Moldova – just to mention a few examples. The whole atmosphere for journalists, at home and abroad, is miserable and why should it be? Just what they are ordered to do for their medium in a scrum never mind where they have to go in very dangerous countries. There must be a better way and the grossly overpaid media moguls have a major responsibility to make this a decent workplace with just basic respect for human life.